There are times when people introduce me to friends as a “foodie” and I feel somewhat of an impostor. It happens especially when I think of my relationship and knowledge of ancient grains. Let’s face it, growing up the extent of grains served were Mexican rice, white rice and oatmeal. Even brown rice didn’t make it to the dinner table. My mom would have looked at me like I was cray-cray if I asked for quinoa or amaranth, spelt, kamut and teff — the quintet of nutritional powerhouses known as the ancient grains. Still, I love ancient grains and am eager to work with them today, especially as I look for healthier ways to enjoy flavorful food. As some of you “real foodies” know, traditionally grown in the Andes, quinoa bears small, tan or red, disk shaped grains about the size of sesame seeds. Quinoa is the Quechua Indian word for mother, reflecting the reverence bestowed on it as “the mother grain.” Quinoa yields a fluffy texture with a distinct flavor and aroma that’s perfect for pilafs, cold salads, casseroles, as a bed for vegetable and bean dishes, and even as a sweet pudding. Rinse well before cooking to ensure no bitter taste. 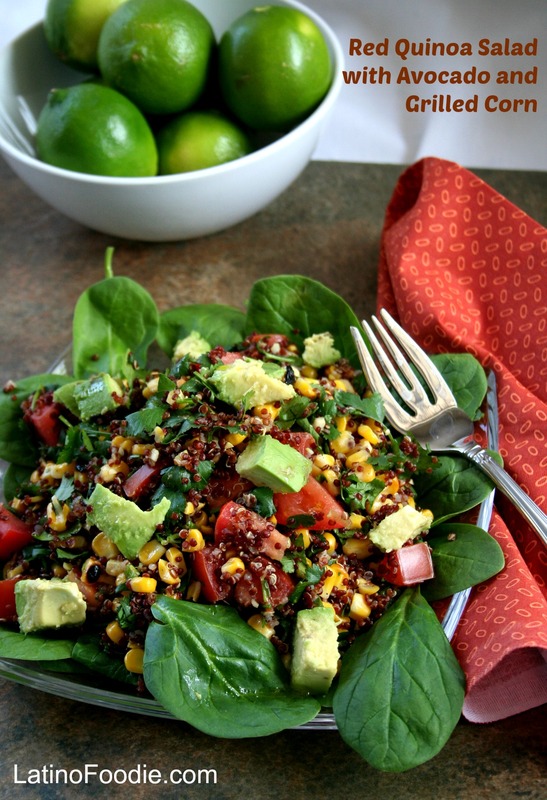 Even better, quinoa is the perfect base for a delicious and flavorful salad, such as the recipe below. The sweetness of the plump tomatoes and grilled corn amplifies the nutty flavor of the quinoa. It’s a spicy salad with the finely chopped serrano pepper popping just enough heat in your mouth like pop rocks. The cumin and lime dressing brings the whole dish together. I found this recipe a while back in the Los Angeles Times, but have adapted it to my taste over the years. ENJOY! Place the quinoa in a strainer and rinse under running water until the water runs clear, 1 to 2 minutes. Turn the quinoa into a medium saucepan and cook over medium heat, stirring constantly. The quinoa will dry, then begin to stick a bit. Keep stirring and eventually it will begin to toast, smell nutty and turn a light golden color (about 5 minutes total). Add the water and one-fourth teaspoon salt, bring to a slow simmer, cover and cook until the quinoa is dry, about 30 minutes. Remove from the heat and set aside for 10 minutes before fluffing with a fork. When ready to serve, transfer the quinoa to a mixing bowl and gently stir in the corn, tomatoes, chile, green onions and 1 teaspoon salt. Combine the lime juice, oil, garlic and cumin in a blender and puree to a smooth dressing. Pour about half of the dressing over the quinoa mixture and stir gently to combine. Add more dressing to taste. Gently fold in the cilantro and avocado. Correct the seasoning with more salt or lime juice, if needed, and serve immediately.